Earlier this week I was lucky enough to spend the evening at a mini Hull Bloggers meet with some of the best people I know. Whilst there we got to try some yummy food from the fab new menu at Furley & Co and we even got a cheeky little goodie bag (or two!). Today I thought I'd share with you a little bit about the night and tell you all about the venue too! So, as I mentioned, the event was at Furley & Co which is a lovely little restaurant/bar on Princes Dock Street, Hull. As there was 7 of us (originally 10 but unfortunately some people couldn't make it) there was a table reserved in advance and when we got there (though a little early) it was all ready and waiting for us! Me, Alex & Kat then set out a place for each person with their cute goodie bags and personalised brownie slices from EatYourPhoto and waited for everyone to arrive. Once everyone had arrived we all made our drinks order and had a lovely catch up while we waited for our food! It was really nice just being able to have a chat seen as I haven't seen some of the girls since September! Now was also the time for us to have a quick sift through our goodie bags! There were some amazing brands included and I can't wait to do another post for you all sharing the items! Food time! 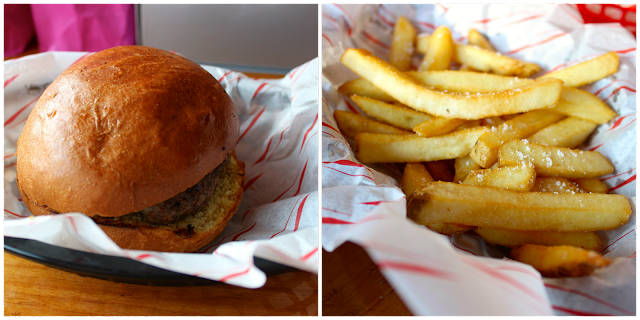 I ordered the delicious homemade 'New York Burger' and chips and let me tell you - I was not disappointed! This meaty burger was packed full of flavour and the chips were cooked to perfection - there was actually comments going round wondering if the chips were triple cooked as they were crispy on the outside but fluffy on the inside! The New York Burger as it is on the menu is a traditional cheese burger with mustard, ketchup and sliced gherkin. However, all of us wanted different options so they decided what would be best was to serve everyone with the plain homemade cheese burger and then serve the condiments in the centre of the table for us to help ourselves! This worked perfectly for us and I played it safe with just the sauces! The food was so delicious and I would definitely recommend anyone to give it a try if they're in the area! Next up, the big one, the drink (dessert?!) 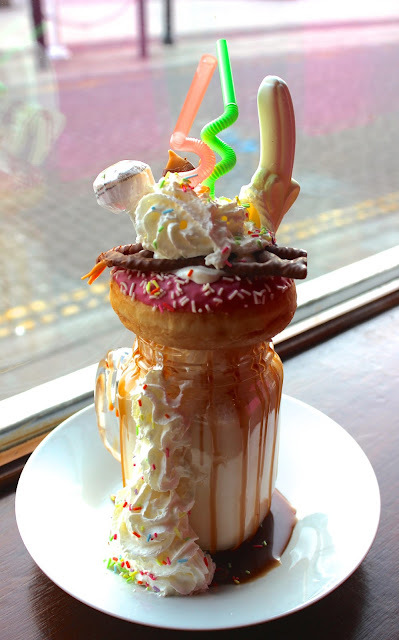 of champions - the freak shake! I went for the Banoffee flavour as that is my all time favourite combo and I couldn't believe my eyes when this was brought to the table! This Banoffee Freak Shake consisted of a Banana Milkshake with toffee sauce and whipped cream on top with an iced ring doughnut, a whole Curly Wurly, foam banana and Double Lolly for decoration! This has to be the highlight of the night and it was also good fun seeing how everyone manoeuvred their way round theirs! All in all I had a really lovely evening with great company and good food! I would just like to thank Furley & Co and also Alex and Kat for making the evening possible! Also a huge thank you to all the brands involved with our goodie bags which really did put the icing on the cake! I can't wait to share with you all some of the individual goodie bag items but for now here's a sneak peak.